For the last two years DH and I have been in a local Chili Cookoff here in town. When you think about it, the idea of a bunch of Iowans trying to make the "best" Texas style chili is a little silly. But it's something to do on the down-side of winter and another excuse to party. So I guess that can't be all bad. 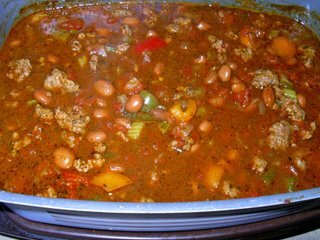 In my experience chili can be divided into two categories: "with beans" or "without beans". According to legend, chili originated with the cowboys (maybe in Texas) and they didn't use no stinkin' beans. I was always under the impression that beans made up the staple cowboy diet, so I would think that the first chili cooker would have probably thrown a handful of beans into the mess that has come to be known as chili. If for no other reason than to have it go further to feed everyone hungry. DH and I come down on the side of beans. We prefer our chili to have some beans in it for the flavor and texture it brings to the soup. And that's another distinction that divides or confuses people. Is chili a soup? Or is it something you put over your hotdog? To me, chili is a soup made to be eaten in a bowl with a spoon. I sure as hell don't want it over rice. As you might have noticed, I use AllRecipes.com a lot. I really like reading the comments and ratings on the recipes and I am continually amazed when people say it's "too runny" or some such thing. I agree that I want my chili to have some body, but that comes when you reheat it the next day. You eat chili with a spoon not a fork! I wish there were a way to distinguish chili "soup" and chili "gravy". 1. In a skillet over medium heat, warm olive oil; brown sausage and stew meat until thoroughly cooked; drain off fat and set aside. 2. Whisk together the beef broth and tomato paste in the slow cooker crock. Add all remaining ingredients as well as cooked meat and stir together. 3. Cover and cook on low for 8 hr. Stir well before serving. I looked up the definition of chili before using this and it said chili was a soup made with various peppers. So I figured "hey! Its got black pepper in it!" and it would qualify. I imagine if I would have tried this in Texas they would have booted me out of the building! So, we're looking for a new recipe to use at this year's Chili Cookoff. Keeping in mind that the final result can have no beans in it, I've been trying various recipes to see how each would hold up under the "no beans" rule. Is it good enough to stand on its own? Today I'm making the following recipe. It's cold and snowy, so I figured it would be a perfect day to try it. I'll have to let you know if this is "IT" - the ultimate Chili Cookoff Contest Winner. 1. Brown ground beef until evenly browned (I threw in a half an onion, too). Drain off grease and season to taste with salt and pepper. 2. In a slow cooker, combine the cooked beef, kidney beans, tomatoes, celery, bell pepper and red wine vinegar. Season with chili powder, cumin, parsley, basil and Worcestershire sauce. Stir to distribute ingredients evenly. 3. Cook on high for 6 hours or on low for 8 hours. Pour in the wine during the last 2 hours. The chili looks tremendous. I'd heard that in Texas you're not supposed to use beans in the chili, but they taste so good! My favourite chili recipe is from www.epicurious.com and it includes a recipe for cheddar shortcakes which are out of this world! Here's hoping you win the cookoff one of these days! Thanks so much Ivonne. We really don't care for chili without the beans either so it makes it hard to come up with a good recipe that will stand alone for the contest. This one was excellent - but I'm not sure how it would be without the beans. It's definitely in the running, though. And thanks for the well wishes. We really don't care if we win or not. It's just fun doing it!